The continuing strength of the Chinese market – both the seemingly endless supply of Chinese ceramics and works of art and the demand for them – has meant provincial auctioneers have had to become increasingly knowledgeable about what is on their doorstep. 18th/19th Chinese gilt bronze Buddha – £6800 at Frank Marshall & Son. So much so, that Knutsford auctioneers Frank Marshall & Son have appointed Dr Eldon Worrall to oversee their expanding Chinese works of art department. Dr Worrall, a consultant to museums and highly regarded writer, will have plenty of work on his hands judging by the entries into the 1350-lot Cheshire sale on July 3 and 4. 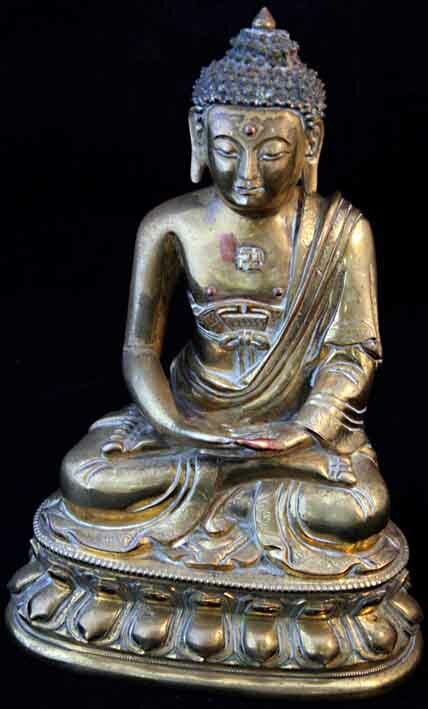 Among them was the 18th/19th Chinese gilt bronze figure of a seated Buddha, shown here, which had been discovered by the auctioneers in a routine valuation on a free home visit in Altrincham. Standing 9½in (24cm) high, it was the object of a fierce bidding war between Mainland China bidding online against British and European collectors in the room and on the phones before selling at £6800. Online bidding has, of course, been another factor in the buoyant Chinese market. At Knutsford, the 701 registered online bidders accounted for nearly 40% of the 1070 lots which got away, contributing £96,000 to the sale's £265,000 total. Other Chinese items to sell well included a pair of Guangxu 'Lotus' cups, c.1908, at £3500, a Qianlong period 'Birthday' dish at £2650 a 19th century Cantonese garden seat (with a damaged base) at £2300 and an 18th/19th century porcelain jar and cover which was painted with dignitaries and attendants at £2200. The buyer's premium was 17.5%.